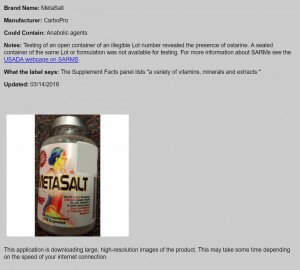 I've long been a carbo pro user, so I was especially disappointed to see that their MetaSalt Brand had been added to USADA's High Risk List. I wrote this earlier for 303 Triathlon, I've no idea if/when they'll publish it and thought it worth sharing here. I went and checked the USADA High Risk List and while there is no indication of a link between Pozzetta and MetaSalt, it’s worth noting that MetaSalt has been updated on the High Risk List (see attached entry). In this case, we had a bottle on the shelf in the pantry. Unfortunately since there is no batch number, or other unique qualifying detail, I can only implore you to discard this if you have it, I did.